Cub Cadet Test Drive Coming to Suburban Soon! Ever wonder what it’s like to drive a Cub Cadet Lawnmower? 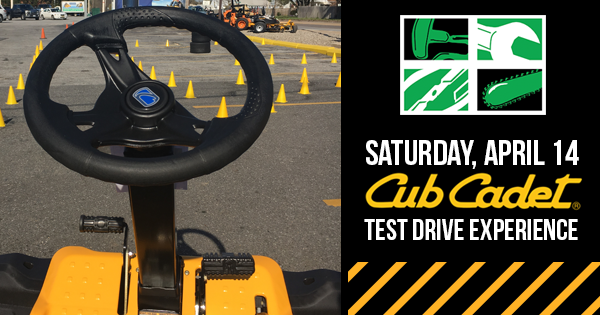 Don’t miss your chance to test drive the season’s latest Cub Cadets at Suburban Lawn Equipment, Saturday, April 16, 2016 from 8 am to 3 pm. There will be a factory sales rep there to answer all your questions. A lawn mower is a big investment and being able to test drive before you buy is a rare opportunity that the big box stores just can’t or don’t offer. Whether you’re a full-service landscaper or homeowner looking for a dependable lawn mower, testing out a Cub Cadet mower can help you choose the right mower for the job. Come by and see us for Cub Cadet product demonstrations on Saturday, April 16th at our place of business (1950 W Newport Pike — Wilmington, DE 19804). If you are not sure which Cub Cadet product is right for your needs, we will assist you. As always, we want you to have the right Cub Cadet product for the right job. For years our customers have turned to us when they needed outdoor power equipment and also when they’ve needed that equipment serviced. Suburban Lawn Equipment offers top quality outdoor power equipment including top of the line mowers such as Cub Cadet to homes and business owners in New Castle County Delaware, Delaware and Chester County Pennsylvania, Cecil County Maryland and Salem County New Jersey. We deliver convenience, efficiency and value for your investments. We are proud of our knowledgeable staff who can explain your options and help you find the right equipment for your home or business. This entry was posted in Commercial Lawn Equipment, Cub Cadet Lawn Mowers, Cub Cadet Test Drive and tagged cub cadet lawn mowers delaware, cub cadet test drive, outdoor lawn equipment delaware, win firefly tickets on April 5, 2016 by Suburban.